Unions decry Detroit's Chapter 9 Bankruptcy, call it "Unconstitutional"
WASHINGTON — Glenn Greenwald’s vendetta against the West will not end, it seems. This time, he may have threatened the United Kingdom with releasing their secrets after airport authorities detained his gay partner in London. Reuters reports that Greenwald, who was the British journalist that NSA leaker Edward Snowden trusted and revealed secrets about the data-heavy agency, was upset that his partner was detained for nine hours. 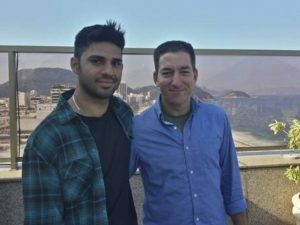 British authorities used anti-terrorism laws to question David Miranda for nine hours. Miranda is a Brazilian citizen and was passing through London’s Heathrow airport. Greenwald is based out of Rio di Janeiro and reports say he felt is was retaliation for his NSA leaks and story. Also, Miranda’s laptop, cell phone and memory sticks were seized by the British authorities. Edward Snowden is now in Russia and has been granted temporary asylum, just when Russian President Vladimir Putin is trying to quell any opposition to his rule.